The National Sandwich Day celebrated on November 3 is an opportunity to honor one of America's most popular foods. 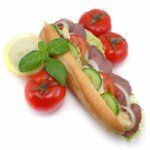 This ultimate and original convenience food was named after John Montagu, 4th Earl of Sandwich. Lord Sandwich was an 18th-century British statesmen. Rumor has it that he was a very conversant gambler and did not like to take meal breaks while playing cards. He ordered his servants to bring him slices of meat between two pieces of bread which he could eat at the gambling table without using a fork, and without getting his cards greasy. Fellow gamblers began to order “the same as Sandwich”. In the United Kingdom and Australia, sandwich is a type of food that includes two pieces of bread sliced from a loaf. In the United States, the term “sandwich” is more widely defined, it also refers to types of food that include an entire bread or bun cut in half such as hamburger, hot dog, or submarine sandwich. Sandwiches are a popular type of lunch food typically taken to school, work, or picnics as part of packed lunch. American cuisine offers a great variety of sandwiches. The most popular varieties of American sandwich include but are not limited to: BLT, club sandwich, peanut butter and jelly sandwich, sloppy joe, French dip, Italian beef, and others.